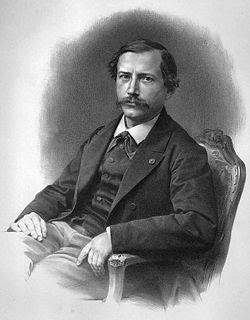 Marcellin Berthelot was born in Paris, France on October 27, 1827. He is regarded as one of the greatest chemists of all time and was responsible for the Thomsen-Berthelot principle of thermochemistry and for disproving the theory of vitalisim by synthesizing many organic compounds from inorganic substances. The fundamental conception that underlay all of Berthelot's work was that all chemical phenomena depend on the action of physical forces which can be determined and measured. When he began his career it was assumed that all organic chemistry depended upon vital forces to produce organic compounds. Berthelot opposed this idea and in order to disprove it he synthesized many organic molecules (including hydrocarbons, and natural fats and sugars) from inorganic starting materials, thus proving that the synthesis of these molecules did not depend of vital forces and that organic chemicals obeyed the same principals as inorganic compounds. His other major contribution is the Thomsen-Berthelot principle of thermochemistry. Berthelot and Dutch chemist Julius Thomsen both independently came up with slightly different formulations for this principle which states that all chemical changes are accompanied by the production of heat and the processes which occur will be the ones in which the most heat is produced. This postulate led to the thermal theory of affinity which postulated that the true measure of chemical affinity was the amount of heat that was produced by a particular reaction. This was later disproved by Herman von Helmholtz, who discovered that the true affinity was not the amount of heat produced by a reaction, but the maximum amount of work or free energy produced when the reaction was carried out reversibly. For his work in disproving the theory of vitalism and pioneering work in the field of thermochemistry Marcellin Berthelot is the Dead Scientist of the Week for the Week of October 25-31, 2009.